Windswept Acres Homestay | Welcome Home! Windswept Acres Homestay: a unique alternative. 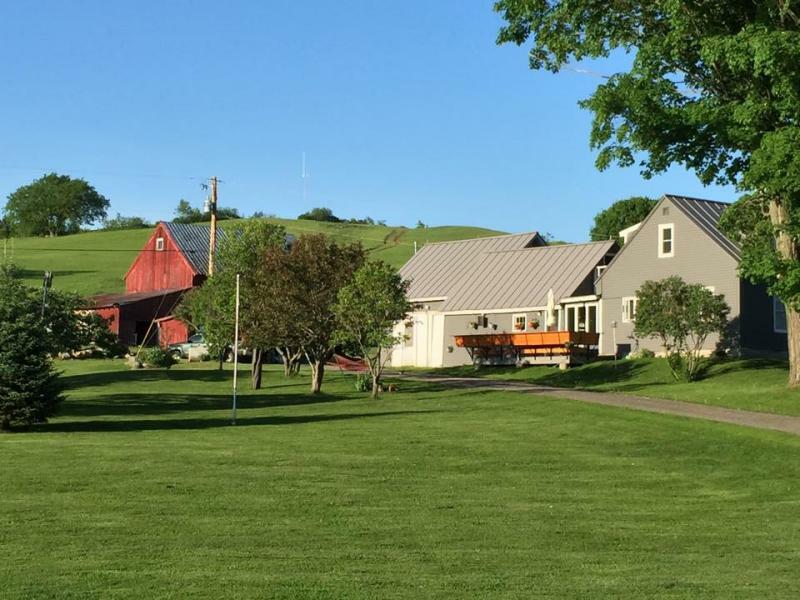 A two-hundred-year-old farmhouse on 55 beautiful acres... Well-appointed, comfortable bedrooms... Unmatched hospitality.... And all of the modern amenities an overnight guest or a family on vacation could ask for - all surprisingly affordable. 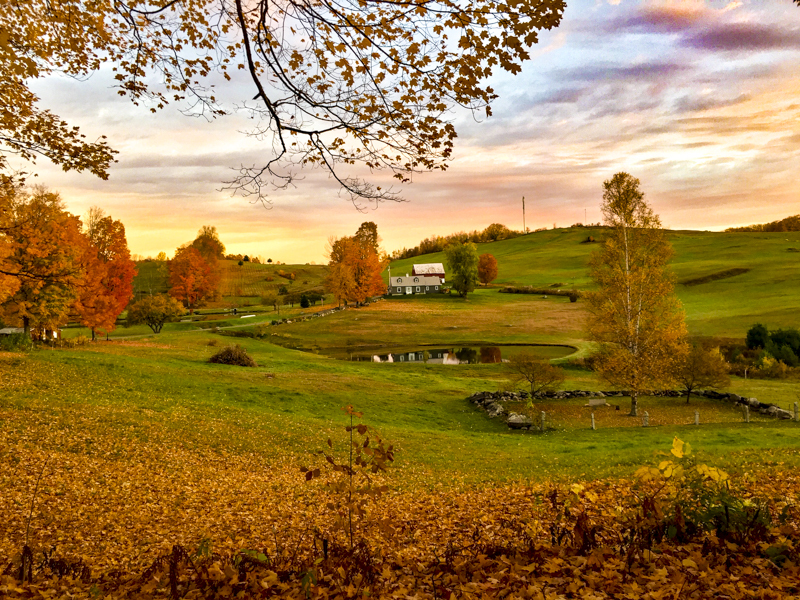 One of Vermont's most attractive locations, Windswept Acres is located on a hilltop in Chelsea, surrounded by ponds, pastures, and history. the most common reaction of first-time guests? "The pictures were wonderful, but we had no idea!" Two ponds afford the opportunity to swim, canoe, fish, or just relax on the beach (not recommended in wintertime, of course!). 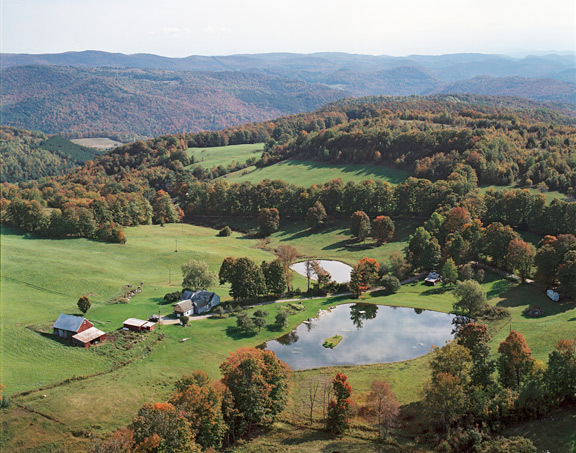 Hikers have a host of choices: explore the hilltops and drink in the views from nearly 1800 feet of elevation; explore wooded trails, check out the neighboring farms or the Hooved Animal Sanctuary, or just wander around, enjoying the lawns and gardens. Feeling more sedentary? Enjoy the morning sun, the bobolinks, and a cup of coffee on the back deck, with direct access from your room, visit in the common room (yes, television and Internet are available - if you like); watch the sun set through the orchard and over the big pond from the front deck, feeding the ducks..... or just nap in the shade and afternoon breeze in a hammock. Like to cook out? Then fire up the fire pit barbecue and enjoy. You have the run of the place. We've even set aside a refrigerator just for you. In addition to the three guest rooms in the house itself, there's a rustic Sugar House for the hardier sort (a great hunting camp equally suitable for "glamping", with wood stove to supplement the gas heat, a full kitchen, and room for 2-4 at a fixed price). Like pumping your water and don't have a problem with an outhouse? Try this sentimental favorite! Prefer to visit in an RV or camper? 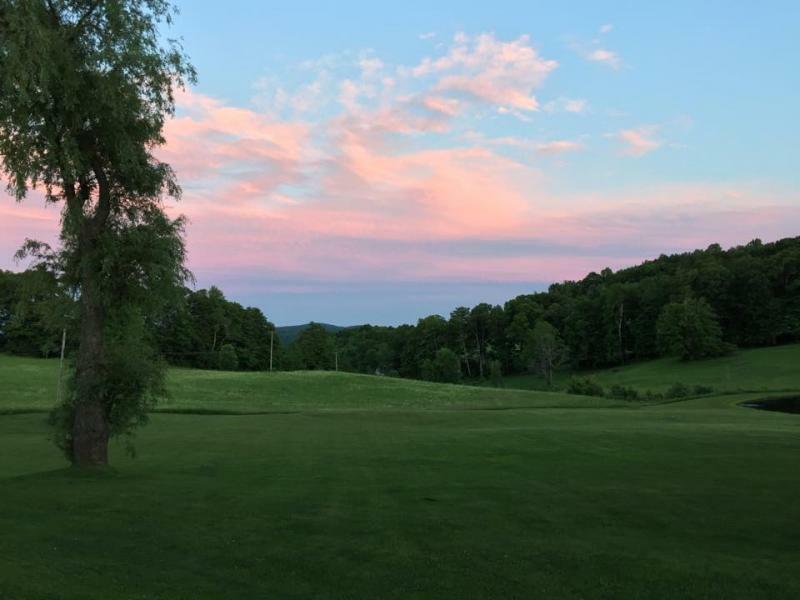 There'll be a special place for you at Windswept Acres - with water, electrical hookup, and drywell for your waste water (sorry: no septic) , privacy, and a great view across the pond. Windswept Acres: more than you could ever expect, and it feels like home from the moment you arrive. We highly recommend reserving your accommodations as soon as you are certain of your plans. While we are not always "slammed", we take our reservations "first-come, first-served". Reservations may be cancelled with full refund of deposit up to seven days before scheduled check-in; we reserve the right to permit cancellation under extreme circumstances within those seven days but strictly at our discretion. Cancellation within those seven days will forfeit deposit. In the event of partial cancellation ("We reserved this Saturday and Sunday nights, but will only be staying Sunday", or variations) where other potential guests have been turned away due to said cancellation, full reservation will be charged. We're a small-volume business, folks, and our availability is limited by that fact. Because of this, we ask potential guests to exercise best judgement when booking! We think that maybe winter is finally gonna be over.... maybe. We’re getting to the cleanup now; with all the heavy, wet snow and windstorms there’s a lot of cleaning up to be done. But it’s starting to dry out and green up, so we hope to be back on track soon. We have had mixed results with our tree-seedling project but most of the seedlings that survived the summer managed to survive the winter as well. Wethink that we're going to continue with it over the next few years. We accomplished a few major "dirt projects" last year, mostly focused on changing the flow of water (never in short supply here) around the barn and garage (as opposed to under or through those structures), and those went well. This year we’ll be replacing the siding on the east side of the barn and building a new chicken coop where the horse stalls used to be, giving the girls a southern exposure for more winter sun and a tighter, more secure roosting space for those cold, dark winter nights. One of the big changes last year was, after a few years without "critters", the addition to the family of five chickens and two guinea hens, who run free and have done a wonderful job of eating ticks, Japanese beetles, and other annoying citizens of rural Vermont (without themselves being eaten, at least so far). The daily egg "take" has been consistent and quite tasty. This spring we broke down and added a puppy to the family: Wesley is ery cute, very smart, and very determined to be a good dog! He gets along well with the birds and the rabbit, and we’re hoping he discourages the local squirrel and chipmunk population which has grown considerably in the absence of cats. We seem to have addressed a worrisome red-squirrel situation with a Havahart trap and a patient week or so, but it’ll be nice to have some help. Another big change last year was our involvement with AirBnB, which has brought us to a completely new market and demographic, and has been an exciting change for us! We tested the waters with Booking.com and Expedia.com, but they didn't really fit who we are, while ABnB has brought us a lot of awesome guests in a manner that is easy for us, with all our other responsibilities, to keep on top of. We have also signed on to Hipcamp.com to get our delightful RV space a bit more exposure and bring in a new group of Windswept fans. As always, we expect to became more and more busy as the summer approaches and wears on. . We are still offering 3-for-2 midweek specials (available M-Th). Stay tuned! We've been so lax about keeping our availability calendars up to date that we've decided to remove them from the site - when it gets busy we just don't have the time. So please use our contact form or your phone to contact us for accurate availability information! We've been pleased with the reaction to our RV space, although we still are scratching our heads as to the best way to get the word out about it. We will be experimenting on Hipcamp. Tell your friends! We're still offering our "three-for-two" midweek special for guests staying Mon-Thurs (in the house only, not for the Sugar House); please be sure to mention when you make the booking! Lastly - for sporadically ongoing reports, pictures, and other Windswept delights, be sure to "like" our Facebook page! See you up here soon! We're happy to announce that the RV site is open for business! Rates are $50/night or $200/week. Copyright © 2019, Windswept Acres Homestay.